Besides smiling, laughing, and communicating, the mouth and teeth serve important functions in the body. Teeth and saliva break down food, making it easier for the stomach to process it further for absorption by the intestines. The teeth provide structural support for the face. 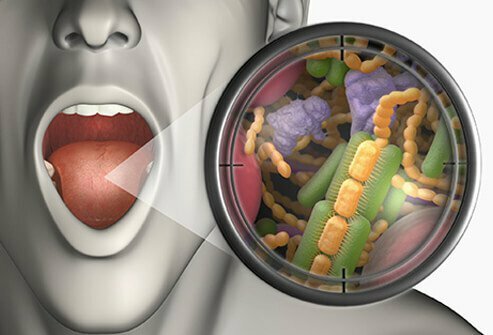 The mouth and throat contain immune cells that help protect the body against pathogens. Taking good care of the mouth and teeth is an essential part of maintaining good health. Here is a guide to some common oral health problems and procedures. An abscessed tooth occurs when an infection moves up tooth pulp and settles into the root near the jaw bone and forms a swollen, pus-filled area. An untreated tooth abscess may lead to a dangerous infection of the jaw bone and other tissues. 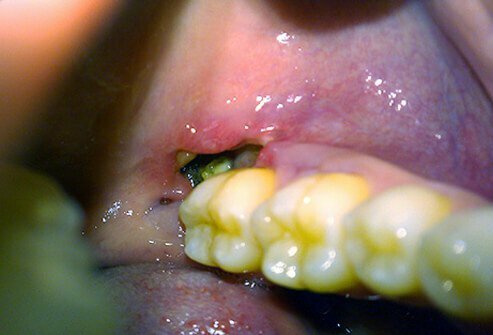 Treatment of a tooth abscess depends on the extent of the infection. Some abscesses may be treated with antibiotics or drainage. In cases in which a cavity or a cracked tooth has exposed the pulp, a root canal may be necessary to treat the abscessed tooth. Cavities are areas of damaged tooth enamel that form when acid erodes away at a tooth. Bacteria are normally present on teeth as plaque. Bacteria produce acid as a byproduct from feeding on sugar in the diet. The acid produced then erodes the enamel and exposes dentin that, in turn, can become pitted and result in a cavity. Good dental hygiene that includes brushing, flossing, and regular teeth cleanings, can help prevent cavities. Treatment of a cavity depends on the extent of the tooth decay. A small or superficial cavity may be treated with a filling. Larger cavities may require more extensive drilling to remove decay and then placement of a crown over the remaining portion of the tooth. Decay that extends to the tooth pulp may require root canal treatment. (A) A small spot of decay visible on the surface of a tooth. (B) The radiograph reveals an extensive region of demineralization within the dentin (arrows). 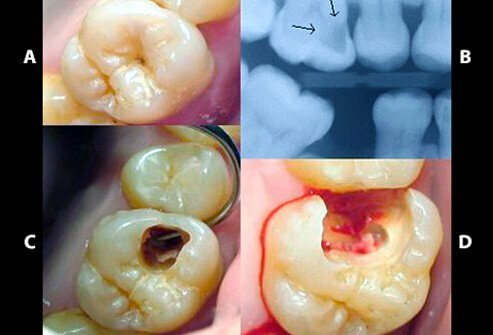 (C) A hole is discovered on the side of the tooth at the beginning of decay removal. A dental crown is a cap that is placed over a damaged tooth to make it stronger or to improve its appearance. Crowns may be placed over a tooth that has a very large filling or one that is cracked. A crown may also be placed in order to serve as support for a dental bridge. 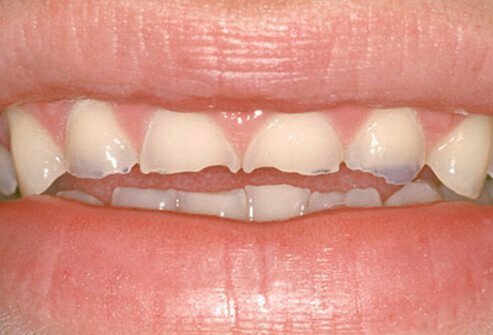 Sometimes a crown is used to disguise an ill-shaped or stained tooth. Dental crowns are available in a variety of materials including porcelain (ceramic), porcelain and metal, metal alloy, and more. A dry socket is a condition that may result after a tooth extraction if the blood clot that normally fills the socket is lost. The dry socket leaves underlying nerves exposed, which is very painful. The condition is treated by a dentist who cleans the wound and places a special dressing into the socket. Over-the-counter anti-inflammatory medications like ibuprofen may be used to treat pain and decrease swelling. 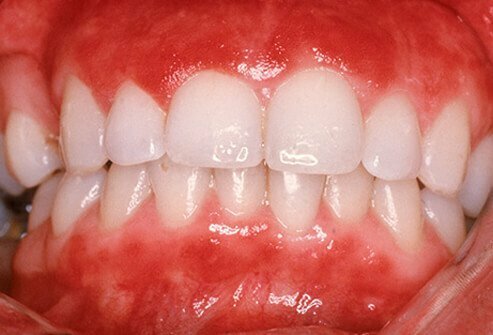 What Is Gum Disease (Gingivitis)? Gum disease (gingivitis) is inflammation of the gums. It is caused by plaque-producing bacteria that build up on the teeth. Severe gum inflammation that spreads to the bones and ligaments that support teeth is called periodontitis and can lead to tooth loss. Lack of good oral hygiene increases the risk of gingivitis. Smoking, diabetes, pregnancy, genetic factors, and certain medications also increase the risk of gum disease. Gum disease is reversible when it is treated in the earlier stages. Regular brushing, flossing, and special dental cleanings and treatments can help prevent and treat gum disease. Saliva lubricates teeth and other tissues in the mouth and helps guard against infection and gum disease. Dry mouth results from a decreased production of saliva. Dry mouth is caused by some medical conditions or the use of certain medications. Diabetes, Sjögren’s syndrome, and HIV are a few conditions that may be associated with dry mouth. Dry mouth may make it hard to speak or swallow. It may also cause hoarseness or a sore throat. Dry mouth increases the risk of tooth decay. Chewing sugar-free gum may help improve saliva flow. A doctor can prescribe special aids, including artificial saliva, to combat dry mouth. 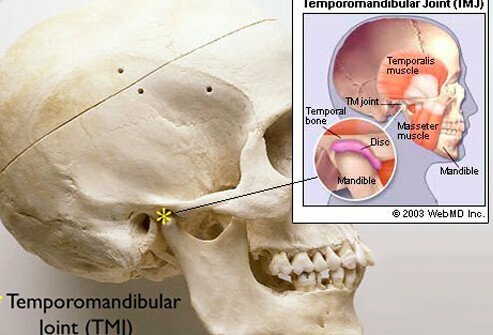 Temporomandibular joint (TMJ) disorders refer to conditions that affect the jaw joint and the associated muscles. Arthritis or structural problems may cause TMJ problems. TMJ disorders may also be a symptom of another condition like chronic fatigue syndrome, fibromyalgia, or stress. Self-care strategies to manage TMJ problems include practicing stress management, applying hot or cold packs, eating soft foods, and avoiding activities that stress the jaw like chewing gum and opening the mouth too wide to yawn. Over-the-counter anti-inflammatory medications can help decrease pain and swelling. A health care professional may recommend jaw exercises, orthodontic treatment, or a night guard to treat a TMJ disorder. Many TMJ problems follow a cyclical pattern, and symptoms may resolve without treatment. Bad breath (halitosis) can be uncomfortable and can have many potential causes. Diet is one potential cause of bad breath. Odiferous garlic and onions can lead to unpleasant breath. Lack of good oral hygiene may allow bacteria to proliferate, contributing to gum disease and bad mouth odor. Sometimes bad breath is the result of another medical condition like dry mouth, diabetes, a lung infection, or others. Good oral hygiene including brushing, flossing, and regular teeth cleaning, can help keep gum disease and bad breath at bay. Using a tongue scraper can help as well. In addition, treating an underlying condition such as dry mouth or diabetes, for example, may also help get rid of bad breath. Tooth sensitivity occurs when hot, cold, sweet, or acidic substances irritate tooth nerves. Teeth are covered by a protective substance called enamel. Under the gum line, the protective substance is called cementum. The layer under the enamel and cementum is the dentin. Dentin supports the enamel and protects the tooth pulp and nerve root in the middle of the tooth. A series of small tubes (tubules) runs through the dentin. Erosions in enamel and cementum allow substances to come into contact with tubules, which irritates the tooth nerve and results in pain. Cavities, gum disease, cracks in teeth, and enamel erosion may all contribute to tooth sensitivity. Treatments may include the use of toothpaste or fluoride gel that blocks pain sensation. A dentist may apply a crown or bonding material over the sensitive area. A gum graft may be necessary to cover a sensitive area in which gums have receded. Wisdom teeth are the very last teeth that people get as a young adult (teens to early twenties). They are called the third molars. Some people may be able to keep their wisdom teeth if they do not cause any problems. 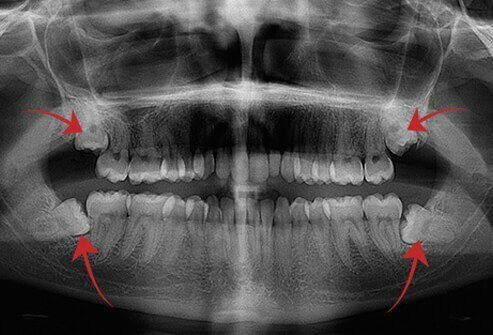 Other times, wisdom teeth may crowd other teeth, cause pain, have decay, or may be associated with gum disease or another dental problem. In these cases, extraction of the wisdom teeth may be warranted. After having wisdom teeth removed, pain is common. There are a few ways to minimize this pain. Take the doctor-recommended pain medicine before local anesthetic wears off and continue taking medicine if pain persists. For mild pain, over-the-counter painkillers like Tylenol and ibuprofen can be taken every 4 hours. Ice packs can be applied to the side of the face where the surgery took place for 20 minutes at a time, followed by a 10-minute break. To slow bleeding, biting a moist teabag for one hour can help. Whether or not to remove wisdom teeth depends on several factors. The recent trend has been to leave healthy wisdom teeth alone and to monitor them. 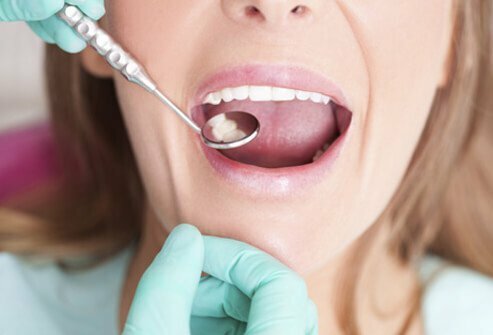 This is because the risk of surgery, which includes permanent numbness and the risk of anesthesia, may outweigh the potential good of routinely removing wisdom teeth. 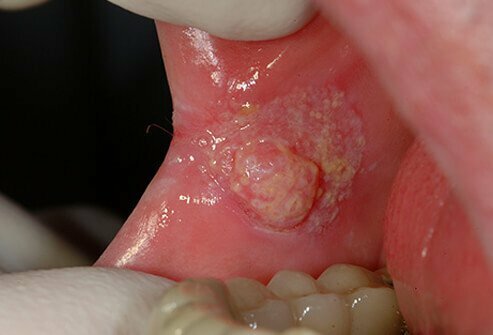 Oral cancer is cancer in and around the mouth including the lips, inside of the cheeks, tongue, roof of the mouth, floor of the mouth, sinuses, and throat. Oral cancer may appear as a lump or sore in the mouth that does not go away. 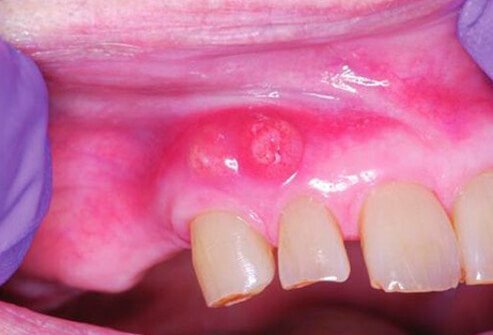 Red or white patches on the soft tissues of the mouth may also signal cancer. People are most likely to get oral cancer in their 50s or 60s. Risk factors for oral cancer include alcohol, tobacco, human papilloma virus (HPV) infection of the oral cavity, and male gender. Excess sunlight exposure to the lips increases cancer risk. Eating lots of colorful fruits and vegetables decreases oral cancer risk. Detecting and treating oral cancers early boosts the chance of a successful outcome. 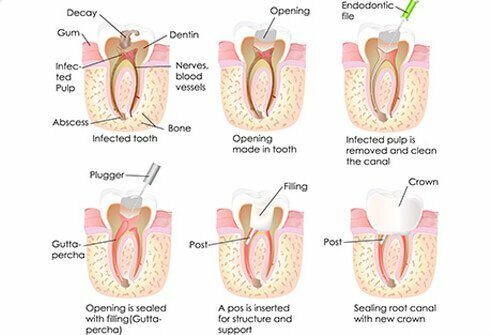 A root canal is performed if tooth decay or an infection affects the tooth pulp. It may also be done if a tooth is injured or damaged, either by trauma or repeated dental procedures. Root canals can eliminate pain and save the remainder of the tooth. A root canal is a procedure in which the tooth pulp and nerve are removed. The canals are then cleaned and sealed. Many times a root canal is performed on a tooth that already has a large cavity or other damage. 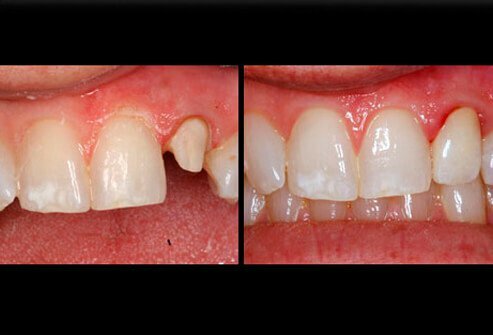 In these cases, a crown is placed over the remaining portion of the tooth to restore its appearance and function. 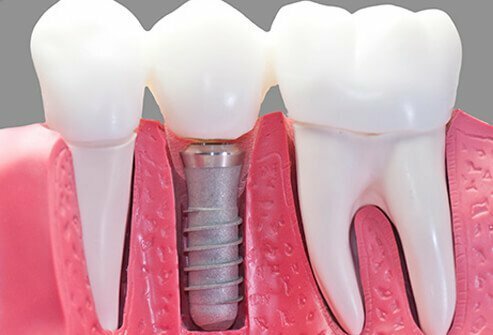 Dental implants are designed to replace missing teeth. First, a titanium post is inserted into the jawbone by a surgeon. Over the next several months, bone grows around and stabilizes the implant. Lastly, a custom crown designed to blend in with the surrounding teeth is placed over the implant. If multiple teeth are missing, an implant may be designed to accommodate a denture or bridge. Toothache is commonly associated with a cavity, but many other things may cause tooth pain. A cracked tooth, an abscess, and gum disease can all be painful. Toothache pain is sometimes “referred pain” from another area like the sinuses. That means the pain is felt in another location other than where it actually originates. A dentist has many tools to uncover the cause of toothache pain. Dental erosion is damage to the hard covering of teeth called enamel. Erosion occurs when acids in certain foods and drinks damage enamel. The most common sources of acids in the diet are fruit, soft drinks, and fruit juices. Avoiding sugary drinks helps protect tooth enamel. Fruit and reasonable amounts of 100% fruit juice are parts of a healthy diet. As long as one brushes and flosses regularly and has adequate saliva flow – which buffers and neutralizes acids – fruit and fruit juice can be safely consumed without harming teeth. American Dental Association (ADA): "Abscess (Toothache)", "Bad Breath", "Crowns", "Dental Materials", "Dry Mouth", "Dry Socket", "Gum Disease", "Implants", "Oral and Pharyngeal Cancer", "Root Canal", "Sensitive Teeth", "TMJ", "Tooth Decay", "Top Ten Dental Symptoms", "Wisdom Teeth"
Cancer.gov: "Lip and Oral Cavity Cancer Treatment"
National Institute of Dental and Craniofacial Research: "Dry Mouth", "TMJ Disorders"
Nemours Foundation: "Mouth and Teeth." The American Journal of Clinical Nutrition "Sugars and Dental Caries"
University of California, Santa Barbara Student Health: "Wisdom Teeth"
University of Oregon: "Extraction of Impacted Wisdom Teeth"